Activity, a gov­ern­ment agency that invests in high-​​risk, high-​​payoff research. Researchers at Oxford Uni­ver­sity, who are part of the same SHARP team as Erdogmus and Pavel, pre­vi­ously demon­strated that applying tran­scra­nial cur­rent stim­u­la­tion helps chil­dren per­form better on math­e­matics prob­lems. “The ques­tion is how well does this method work for improving fluid intel­li­gence,” said Pavel, who holds joint appoint­ments in the Col­lege of Com­puter and Infor­ma­tion Sci­ence and the Bouvé Col­lege of Health Sci­ence. via Can current stimulate smarts? | news @ Northeastern. Jared Seehafer wearing his homemade tDCS device. That’s what Jared Seehafer did. He’s a 28-year-old medical device consultant in San Francisco who heads the group. 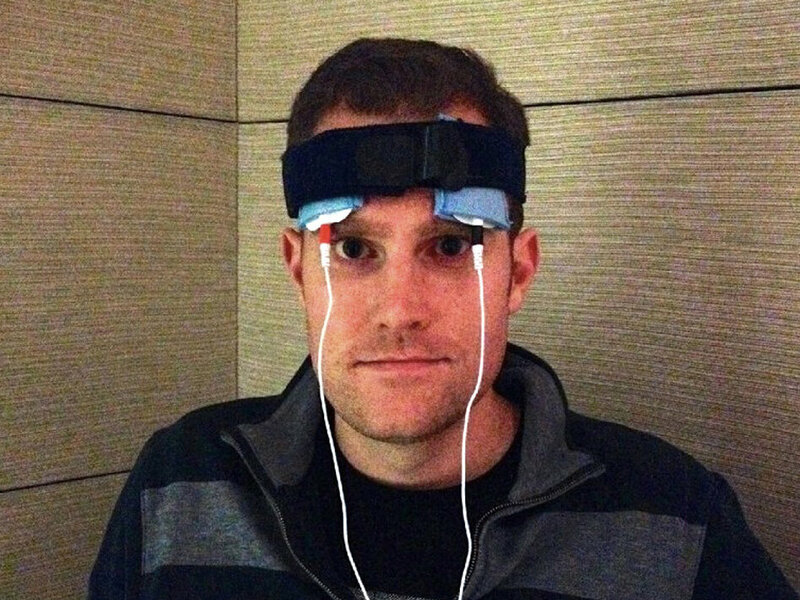 He made his own tDCS machine using an elastic headband and a couple of electrodes. It’s powered by a 9-volt battery and produces 1 to 2 milliamps of electricity, approximately what it takes to light one small LED bulb. via Hacking The Brain With Electricity: Don’t Try This At Home : Shots – Health News : NPR. Here’s the point of it all… remember the cancer and the climate change and everything. What if you could help people solve those problems? What if there was a thing, that you could do, that in just a few minutes would change the way our best computer works? And this is the thing that I’ve been working on. Doing a little detective work today in an attempt to better understand Halo Neuroscience. 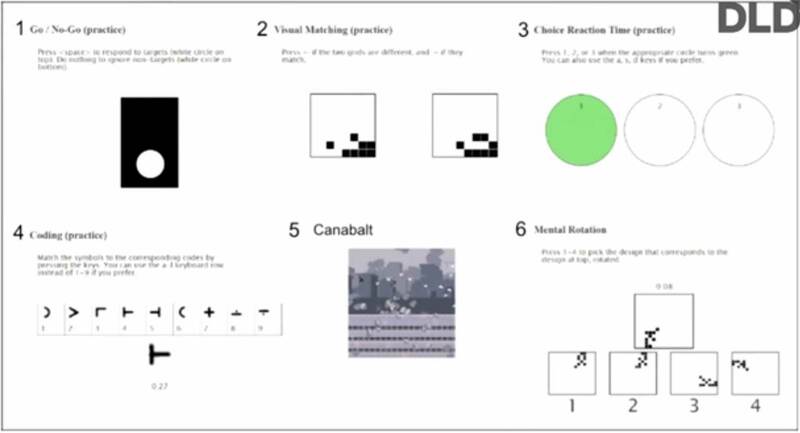 The 9-dots test, Bingo! The inspiration is Alan Snyder and his ‘inner savant‘ and an article Amol read 13 years earlier (before his fantastic success with Peek and smartphones). And the ‘vision’. March 19, 2014 This is the video from which the opening quote is taken. In another talk at DLD Jan 21, 2014, Amol mentions that they are now doing double-blind studies and uses this slide to demonstrate. Anyone recognize this particular test suite? It would appear that Amol is the visionary at the core of Halo Neuroscience, but the team reads like a who’s who of Silicon Valley. I’ll follow-up with a look at some of the other team members soon. A few weeks ago a new player came on to the scene (for me anyway) via an article, Halo headband wants to make you smarter by shocking your brain. Interesting, but kind of vague. TheVerge’s Ben Popper subtitled it A far-fetched gadget has backing from the tech industry’s biggest investor. Exactly. Today I got around to looking at the HaloNeuro website, basically a place-holder webpage, except for the team. What sort of ‘headband’ would warrant such a distinguished collection of Silicon Valley heavyweights? They also just announced a recent round of funding! Something is up in tDCS land. via Halo, The Brain-Improving Wearable, Raises $1.5 Million | TechCrunch. HatTip to Jay who is working on a tDCS/lucid dreaming project of his own. tACS is transcranial alternating current, significantly more complex, from what I gather than tDCS. But perhaps a DIY tACS device set to 40 Hz specifically won’t be out of the question for DIYers. As someone who spent months (unsuccessfully) doing lucid dreaming exercises I certainly would welcome the opportunity to experience lucid dreaming. The new dream study (paywall), which was published May 11 in Nature Neuroscience, used a far less invasive method: electrodes temporarily placed at strategic locations on the scalp. The research involved 24 volunteers with no history of lucid dreaming. The subjects went to sleep and eventually dreamed. Then, researchers turned on a 30-second-long electrical signal and then woke them up and asked them about their experiences. It turned out that a 40 Hz stimulation induced lucid dreams 77 percent of the time. You can’t objectively measure a dream, though. So how did researchers know that the subjects weren’t just making it up? For one, the electrical stimulation was gentle enough that people couldn’t feel it, and some people were in a control group that had electrodes that never got turned on. Also, the study was double-blind: neither the volunteers nor the people who interviewed them were told who had what kind of stimulation. So it does seem that the effects were real. via Scientists find switch for people to control their dreams – Vox. Neurolectrics (Starstim device) published a white paper (pdf) in October 2013 that nicely collects pretty much all we know to date about tDCS and cognitive enhancement. I was reminded of this while visiting their montages page on their new wiki. Quoted is from the Chi / Snyder 9 Dot study (pdf). Nicely done! Brent Williams in Wired magazine. Williams is one of its leaders. The treatments have made a huge difference in his life, he says. He retains more information from the tedious journal articles he has to read for work, and he feels more creative. On his blog, SpeakWisdom, he posts technically detailed reviews of stimulation devices and cheerfully gives advice to anyone considering trying it for the first time. He’s got lots of company. A subreddit devoted to the practice has nearly 4,000 subscribers who actively follow the scientific research and share tips on where to place the electrodes on your head if, say, you’re depressed, too impulsive, or just want to amp up your creativity. Williams is spreading the brain-zapping idea closer to home too. He has built brain stimulators for his wife (he couldn’t keep the secret very long) and several friends and acquaintances. All in all, he has persuaded at least a dozen people to give it a try. One says she’s gone off antidepressants for the first time in 20 years. Another says brain stimulation is helping him get his ADD under control. Several ambitious middle-­aged professionals say the devices have boosted their memory and focus. via Inside the Strange New World of DIY Brain Stimulation | Magazine | WIRED. Just as the scientists are taking stock of what they do and don’t know about tDCS and refining their experiments, the DIY community seems to be enthusiastically forging ahead. Driven by frustration with pills that don’t adequately manage their depression or chronic pain, or by the desire to be sharper and more focused, ordinary people taking the science out of the lab and into their lives. They’re able to do it, in part, because the scientific literature is becoming more accessible than ever, and online forums like blogs and reddit are providing new ways for likeminded people to find each other and share information. It helps that a tDCS device is relatively cheap and easy to purchase or assemble. via The Unfinished Science Behind the New Wave of Electrical Brain Stimulation | Science | WIRED.